I am considering buying a motorcycle half helmet for cycling. I ride road bike for leisure. I would ride alongside with traffics quite often. First of all, I am looking for more protection. I am not sure can ordinary bicycle helmet provides enough protection for lateral shock if I hit the ground. Secondly, I really like the retractable shield. I wish to protect my eyes from UV and dirt. However, I cannot wear googles as I am shortsighted. 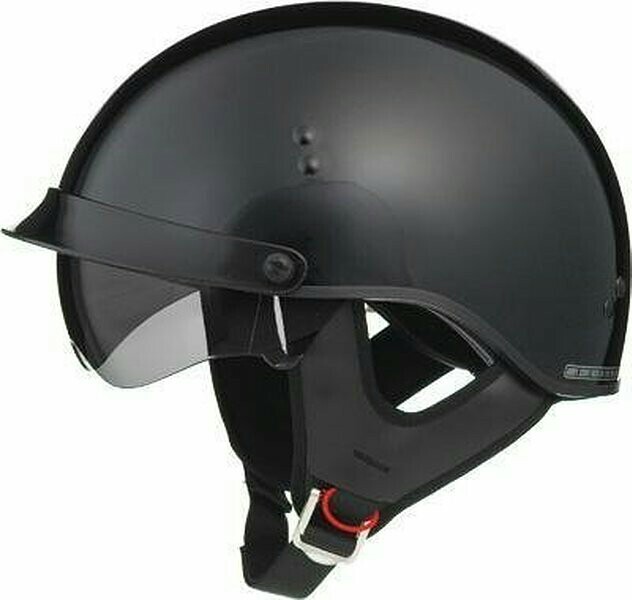 Bicycle helmets with shield are even more expensive then such motorcycle helmet. Is it practical to wear such helmet for road cycling? For example, are there heat, comfortability or sight blocking issues? Firstly, to answer you question - no, it's not practical for me. Since this is a question of personal safety, no-one can make your decision for you. So in the rest of this answer I will try to set out the issues. It's fair to say that the issue of cycling helmets has been contentious in the past, so I'll give a recap of that. I say in the past because most Western countries have laws requiring cyclists to wear helmets. The contention now comes from small numbers of die-hards (pun intended). Firstly, you would need to find out if it's legal to wear a motor-bike helmet on a bicycle. Most (western) countries Australia and New Zealand have laws requiring cyclists to wear helmets that are approved for that use (thanks to @7thGalaxy for the correction). The approval process usually involves the local national standards and testing bodies. Before a helmet can be sold as a cycling helmet is has to go through an approval process. I would expect that a motor-bike helmet would not have been approved for use as a cycling helmet. The purpose of a helmet is to provide head and brain protection in the event of impact. Bicycle helmets are designed with a harder outer shell and a softer crushable liner. The outer shell protects the crushable liner from the wear and tear of regular use, and resists abrasion should your head be sliding along the bitumen pavement. Without the shell the liner would quickly wear through, exposing your head to the road. Some very cheap helmets omit the outer shell. The crushable liner has been calibrated absorb the shock of impact at cyclist speeds. It absorbs the impact by deforming; the peak forces are absorbed and are not transmitted to your skull and brain. This is why helmets must be replaced after a crash. The motor-bike helmet protection system will be calibrated for higher impact speeds, and so will give little brain protection at cyclist speeds. There are two sides to safety. Firstly, is the product safe to use? Safe to use primarily means not impairing the cyclists vision or hearing. From your image it is not clear how the motor-bike helmet performs here. But it will certainly be heavier than a bike helmet, making it harder to turn your head frequently. The lack of ventilation also means that your head and brain could be subject to higher than normal temperatures. The evidence is clear that when the human brain is too hot it does not function as well, especially in decision making. My recollection is that it leads to riskier decisions. Now we get to the main point of contention. The research is clear that if we provide people with safety equipment then on average they take more risks. It is very politically incorrect, but there is good evidence to suggest that helmets have done nothing to improve cyclist safety. Proponents of this view argue that any improvements in safety is due to better roads, better laws, better driver education. That argument means that if you feel safer in the motor-bike helmet, then you are more likely to do more dangerous things. The road is dangerous enough as it is; don't add to your own danger. The helmet pictured is black and has no vents. It will be hot and uncomfortable to wear. On every perspective I can think of, my advice is don't do it. But you have to decide. That said some bicycle helmets are safer than others. Not cheap but check out POC. It has to be a helmet you will wear. I have a POC but I wear my lighter racing type helmet often because it is more comfortable. Bicycle helmets are certified for the types of impacts that one would encounter while having an accident on a bicycle. Motorcycle helmets need to be able to endure much more, because riders are going much faster and have more momentum should they crash. Professional road racers ride much faster than the average cyclist (25 mph to 28 mph on flat terrain, in the case of the Tour de France), and they wear road bike helmets, not motorcycle helmets. Having a lighter helmet designed for cyclists will allow you to turn your head more easily, which is critical when looking backwards before entering traffic. You’ll also appreciate this lightness on long climbs. The lack of ventilation on the motorcycle helmet might not be so much of an issue if you’re travelling down the highway on a motorbike at 55 mph, but for a 20 mph ride on the road, there will probably be sweat pouring down into your eyes. The function of the shield can be accomplished by getting a cheap, light pair of goggles and putting them over your eyeglasses. I’m partial to these no-name ones because they’re cheap and come with tinted and clear lenses. They will fog up more than your motorcycle helmet’s shield when you’re stopped, but any fog on goggles should dissipate in a few seconds once you start moving again. If sun in your eyes is still an issue, you could try a mountain bike or commuting helmet that has a visor on the front. A motorcycle helmet will be too hot and heavy for cycling. Spend $20 USD and get a cheap bicycle helmet - you'll be a lot more comfortable and happy. no. it doesn't help and will just make you uncomfortable with a lot of heat and i imagine its quite heavy which will put strain on your neck. you could maybe try a downhill helmet but really a road helmet is designed for safety of road cyclists. it does provide adequate protection, unfortunately i know this from experience. there are also goggles for those of less than perfect eyesight. i have one of those. they cost a little more (upwards of 100 euro) but it solves that problem. Not the answer you're looking for? Browse other questions tagged road-bike safety helmets or ask your own question. What are the pros and cons of sunscreen vs. protective clothing? Can a guy wear a woman's helmet safely? Is there anything concerning about buying a half-price “test helmet” from my local bike shop? How long does an unused helmet keep for? Can you get your cycling helmet wet?